More than one-fourth of Colorado teens have used e-cigarettes recently — the most in the nation. Three out four high school students in Colorado who currently smoke cigarettes also currently use e-cigarettes. Multiple policy efforts to regulate e-cigarettes have failed in Colorado, putting Colorado a step behind other states that have implemented e-cigarettes taxes, licensed e-cigarette retailers and other regulatory policies. Cinnatoast Munch. Pebbles Donuts. Ultra Magnetic Fruit Loop. These might sound like the names of breakfast cereals targeting kids, but you won’t find them in any grocery store. Instead, they are flavors added to the liquid in e-cigarettes, the increasingly popular battery-operated cigarette substitutes that produce a vapor containing nicotine and other chemicals. But research hasn’t kept pace with this explosive growth, and little data exists about possible long-term health implications of using e-cigarettes. A product that was launched a little more than a decade ago as a safer alternative to smoking tobacco is now fueling a great deal of debate. Public health advocates worry that e-cigarettes are contributing to a new generation hooked on nicotine, a “gateway” to cigarette smoking that could reverse years of declining cigarette sales. Medical professionals fear that inhaling the flavored vapor in e-cigarettes will cause harmful health consequences down the road. Others, particularly manufacturers and retailers, argue that e-cigarettes are less harmful than tobacco and that they help smokers cut back and ultimately kick the habit. How the debate plays out will affect the breadth and timing of future regulations. Already, the federal Food and Drug Administration (FDA), states and localities are moving quickly to address e-cigarette policy through new laws and rules. This paper provides a closer look at e-cigarette use, summarizes the known health effects and outcomes, and reviews policy options. Listen to report author Jalyn Ingalls discuss the implications of her research. E-cigarettes, also known as electronic nicotine delivery systems (ENDS), simulate the experience of tobacco smoking. Many even look like a cigarette. E-cigarettes come in disposable and rechargeable models. Vape and vaporizer devices have refillable cartridges called pods, which contain the liquid that is heated. These devices do not burn tobacco like traditional cigarettes do. Cartridges can last for a day or two weeks, depending on how often the user takes a puff. The term e-cigarette is used in this paper. Some research and data may use the term e-vapor product. Other common terms: Vapes, vaporizers, vape pens, hookah pens, electronic cigarettes, and e-pipes. E-cigarettes, also known as electronic nicotine delivery systems (ENDS), simulate the experience of tobacco smoking. Many even look like a cigarette. But there are important differences. Models: Some are disposable, others rechargeable. Chemicals: Cigarette smoke contains as many as 7,000 chemicals, some carcinogenic. E-cigarette vapor has far fewer chemicals, but does contain potentially harmful metals like lead, volatile organic compounds and cancer-causing agents, according to the Centers for Disease Control and Prevention (CDC). Cost: A pack of 20 cigarettes averages $5.35, including taxes, in Colorado. That’s about a dollar less than the national average. By comparison, a JUUL pod averages $4.36, including taxes based on Colorado’s tax structure. The pod can last from a day to two weeks, depending on how often the user takes a puff. Colorado high school students vape at more than double the national rate — 26.1 percent report using an e-cigarette in the past 30 days, according to the 2015 Healthy Kids Colorado Survey (HKCS). Three of four Colorado teens who smoke cigarettes also report using e-cigarettes, the survey found. Colorado adults are much less likely to use e-cigarettes than the state’s teens. About five percent of adults say they’ve used e-cigarettes recently, according to the 2016 Behavioral Risk Factor Surveillance Survey (BRFSS). Of those, only about a third say they are daily or near-daily users. E-cigarettes present public health advocates with a dilemma: weighing e-cigarettes as a tool to cut back or quit smoking versus the potential health risks of inhaling vapor that includes nicotine and chemicals. E-cigarettes have some benefit if a user substitutes them for regular cigarette smoking, according to the CDC. That’s because they produce fewer harmful chemicals than cigarettes. But more research is needed about how well e-cigarettes work to help quit smoking, the CDC adds. It has also warned that e-cigarettes aren’t safe for youth, young adults, pregnant women, or adult non-smokers.7 Though they produce fewer chemicals, they still expose the user to some chemicals and can lead to a nicotine addiction. Increase the risk of adolescents smoking cigarettes in the future. The committee found, however, that e-cigarettes have fewer harmful toxins and cancer-causing chemicals than cigarettes. Two reports. Two countries. Two different opinions. The United Kingdom’s public health agency and the National Academies of Sciences, Engineering and Medicine (NASEM) released reports within weeks of each other that reached different conclusions about the health outcomes of e-cigarette use. The NASEM report concludes there is “substantial evidence” that e-cigarette use among adolescents increases the risk of smoking later on. The U.K. report concludes evidence does not support the concern that adolescent e-cigarette use leads to cigarette use. The NASEM report says there is “limited evidence” supporting the use of e-cigarettes as a stop smoking tool. The U.K. report projects that e-cigarettes could contribute to at least 20,000 successful quit smoking results per year. Many health officials in the U.S. are discouraging e-cigarette use, particularly among nonsmokers. Their U.K. counterparts are focusing on the potential benefits of e-cigarettes for current cigarette users, saying that e-cigarette use is 95 percent less harmful than smoking cigarettes. The diverse approaches each country is taking, both in policy and communications, can provide researchers with an opportunity to compare e-cigarette regulation strategies and outcomes. Here is a look at what is known about e-cigarettes, based on the NASEM report findings. Question: What do we know about nicotine levels in e-cigarettes? Answer: The levels of nicotine in e-cigarettes are similar to levels in cigarettes. However, this depends on the e-cigarette product, which have varying amounts of nicotine. JUUL Labs, which makes the JUUL e-cigarette that a growing number of teens are using in classrooms and elsewhere, reports that the amount of nicotine in one vapor pod, or cartridge, is equivalent to one pack of 20 cigarettes. But one vapor pod can last a day or two weeks depending on how often the user takes a puff. Question: What do we know about the levels of toxins and carcinogens in e-cigarettes? Question: Do e-cigarettes cause changes to the cardiovascular or respiratory system? Answer: There is evidence that a person’s heart rate increases after e-cigarette use. There is not enough research to determine if use causes long-term changes in heart rate or risk of clinical cardiovascular outcomes, such as stroke or heart disease. There is no available evidence on whether e-cigarettes cause respiratory problems. Question: What do we know about e-cigarette use and cancer? Answer: Vapor products are relatively new, and few studies have examined their relationship with cancer. But there is substantial evidence that chemicals in e-cigarette vapor, such as formaldehyde, can cause DNA damage. This suggests long-term exposure to the e-cigarette vapor could increase the risk of cancer. Question: Can pregnant women safely use e-cigarettes? Answer: There is little research on whether e-cigarette use during pregnancy risks the health of the mother or fetus. However, research does show that using nicotine during pregnancy can lead to increased risk of miscarriage and low birthweight, suggesting that e-cigarettes pose a risk as well because they contain nicotine. Question: Can a person reduce harm to their health by switching from cigarettes to e-cigarettes? Answer: Yes. Completely switching from smoking to e-cigarette use reduces exposure to the toxins and cancer-causing agents in cigarettes, according to the research. Question: Can e-cigarettes help a smoker to quit? Answer: Evidence is mixed. The report says there is not enough research comparing e-cigarettes with FDA-approved smoking cessation aids to reach a conclusion. However, there is moderate evidence that more frequent e-cigarette use is associated with a reduction in smoking or quitting cigarettes. Moderate evidence means most studies support the conclusion, but there are limitations to the research. Question: Does e-cigarette use lead to cigarette smoking among youth and young adults? Answer: Research supports that e-cigarette use among youth and young adults increases their risk of smoking cigarettes. Question: Does second-hand exposure to e-cigarette vapor pose a health risk to others? Answer: There is moderate evidence that second-hand exposure to e-cigarette vapor is less harmful than second-hand exposure to cigarette smoke. There are limitations to the research, however. Finally, the report identifies a need for further studies on using e-cigarettes to reduce cigarette use. Other studies highlight the necessity of rigorous and systematic evaluation, including randomized-controlled trials assessing the use of e-cigarettes specifically for cigarette smoking cessation. They also emphasize the need for clear definitions of usage levels and frequency. 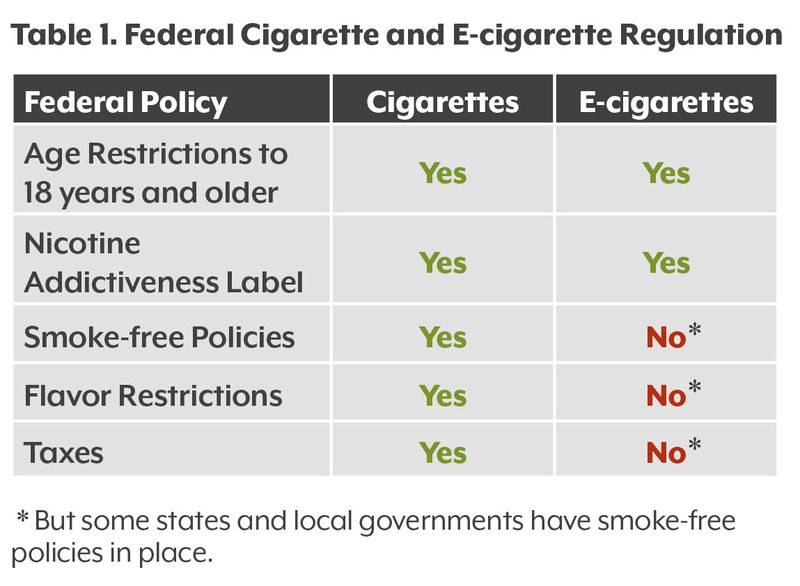 Most e-cigarette regulation efforts are coming directly from the tobacco regulation playbook. The FDA, starting in 2016, began regulating e-cigarettes under the Family Smoking Prevention and Tobacco Control Act. The law prohibits the sale of e-cigarettes to minors, selling them in vending machines or distributing free samples. Later this summer, in August, e-cigarettes must have a warning label saying that nicotine is addictive. And by the end of 2018, all manufacturers will need to submit an ingredient list to the FDA. And on tap for 2019, e-cigarette manufacturers will have to report the quantities of FDA-designated harmful or potentially harmful components in their products to the FDA. The FDA is also looking at options for regulating the flavors added to the e-cigarette liquids. Additionally, the FDA plans to require e-cigarette manufacturers to file so-called public health applications providing details about their products and the impact on public health. FDA Commissioner Scott Gottlieb pushed the deadline to 2022 from August 2018, saying both the FDA and manufacturers need more time for research. Several organizations, including the Campaign for Tobacco-Free Kids and the American Academy of Pediatrics, have sued the FDA, contending the delay will result in more consumers being exposed to harmful products. While that issue plays out, the FDA has implemented enforcement actions, the first part of the Youth Tobacco Prevention Plan, to stop youth from using tobacco products, and in particular, e-cigarettes. These actions include an undercover blitz of retail establishments to crack down on illegal sales of e-cigarettes to minors. 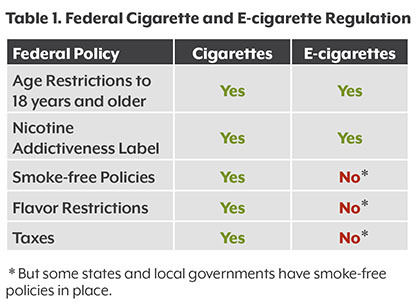 State and local governments can also regulate e-cigarettes — to a point. Some policy efforts in Colorado have failed, including bills to add warning labels to nicotine products and licensing retailers who sell nicotine products. Colorado has relatively fewer policies than other states. Elsewhere, state and local regulators employ multiple strategies to regulate tobacco — some of which have been used to regulate e-cigarettes — such as taxing products and regulating flavors along with campaigns to reduce tobacco use or stop people from smoking altogether. A potential strategy to discourage youth from using e-cigarettes is taxing them to increase the price. But some policymakers worry that higher prices might discourage cigarette smokers from switching to less harmful e-cigarettes or using them to kick the habit. Research concludes that increasing the price of a pack of cigarettes by 20 percent would cut the number of cigarettes smoked by 10 percent and reduce the number of youth starting to smoke by eight percent.12 This is known as an inverse relationship — as price goes up, consumption goes down. Supporters of an e-cigarette tax suggest that increasing the price would accomplish two goals: discouraging youth from using e-cigarettes and stopping them from smoking cigarettes in the future. Nine states currently tax the devices, ranging from five cents per milliliter of e-liquid in North Carolina and Louisiana to an excise tax of 95 percent of the wholesale price in Minnesota. That tax range adds between four cents and $3.80 to the average $4 cost of a JUUL pod. Minnesota in 2012 became the first state to implement an e-cigarette tax. Even so, cigarette use increased by 50 percent among Minnesota’s teens between 2014 and 2017.14 One explanation may be that consumers turned to online purchases. There is an opportunity to evaluate whether taxes are an effective regulation tool when it comes to e-cigarettes. Supporters of e-cigarettes think they can be effective in helping smokers to quit. But others look to the experience with cigarettes and don’t think it’s a good idea to wait to regulate a product that could lead to a new generation of nicotine dependence. Currently, there are seven FDA-approved tools to help smokers stop as well as other strategies aimed at would-be quitters such as counseling and motivational interviewing.15,16 Advocates of e-cigarettes want the devices added to the FDA’s list, which could mean that insurers would consider covering some of the costs of the devices when used to help kick the habit. What policy strategies can be used to prevent a new generation from becoming addicted to nicotine? Are e-cigarettes an effective smoking cessation tool? Should they be promoted as a more effective than other cessation tools? E-cigarette manufacturers use chemicals to flavor the liquid that, when heated, produces vapor. This results in names like juicy nerds, peachy rings, and sour worms. Because of the wide appeal, regulating flavoring could deter youth from vaping, but it also could discourage adult smokers from switching to e-cigarettes. The federal Tobacco Control Act, which regulates the marketing of cigarettes, banned flavored cigarettes in 2009. However, these regulations do not extend to e-cigarettes. The same law prohibits states from regulating the e-cigarette manufacturing process, so a state can’t ban the production of flavored e-cigarettes. States can, however, regulate the sale and distribution of these products. Providence, Rhode Island, among other local governments, restricts the sale of all flavored e-cigarettes except menthol, mint and wintergreen flavors. The tobacco industry sued the city, but the courts ruled that restricting the sale of flavored e-cigarettes did not violate federal law. San Francisco voters in June banned the sale of flavored tobacco products, including menthol cigarettes and flavored vaping liquids. The link between advertising and use may provide more ammunition for advocates who want to ban e-cigarette ads — a strategy used to reduce cigarette consumption. Weighing the pros and cons of vaping while trying to creatively regulate e-cigarettes will be a test for policymakers and the public health community as popularity of the products continues to grow. All eyes will be looking for additional data and research to inform the debate. In Colorado, new findings will come from the 2017 Healthy Kids Colorado Survey, results of which are scheduled to be released this summer. The survey includes more detailed questions about e-cigarette use among Colorado youth. Top of page: Employees of Denver Vapor exhale e-cigarette vapor behind the counter. Middle: E-cigarettes often come in sweet flavors, which researchers say appeal to young people. Bottom: Marketing efforts, such as this nostalgic sign that promotes marijuana vapor products, are designed to boost the cachet of vaping among young people. Special thanks to Denver Vapor for allowing us to take photos for this report. 1 Loesche, D. (2017). “Vaping has picked up worldwide.” Statista. Available at: https://www.statista.com/chart/9607/sales-electronic-cigarettes-dollar-sales-worldwide/. 3 Colorado Department of Public Health and Environment (CDPHE). “2015 Healthy Kids Colorado Survey Results.” Available at: https://www.cohealthdata.dphe.state.co.us/. 6 CDPHE. “2016 Behavioral Risk Factor Surveillance System Results.” Available at: https://www.cohealthdata.dphe.state.co.us/. 7 Centers for Disease Control and Prevention. (2018). “Electronic Cigarettes.” Available at: https://www.cdc.gov/tobacco/basic_information/e-cigarettes/index.htm. 8 The National Academies of Sciences, Engineering and Medicine. (2018). “Public Health Consequences of E-Cigarettes.” The National Academies Press. Available at: http://nationalacademies.org/hmd/reports/2018/public-health-consequences-of-e-cigarettes.aspx. 11 American Nonsmokers’ Rights Foundation. (2018). “State and municipalities with laws regulating use of electronic cigarettes.” Available at: https://no-smoke.org/wp-content/uploads/pdf/ecigslaws.pdf. 12 Community Preventive Services Task Force. (2014). “Reducing tobacco use and secondhand smoke exposure: Interventions to increase the unit price for tobacco products.” Available at: https://www.thecommunityguide.org/sites/default/files/assets/Tobacco-Increasing-Unit-Price.pdf. 13 Pesko, MF, et al. (2017). “E-cigarette price sensitivity among middle- and high-school students: Evidence from monitoring the future.” Addiction 113: 896-906. 14 Minnesota Department of Health. “2017 Minnesota Youth Tobacco Survey.” Available at: http://www.health.state.mn.us/divs/hpcd/tpc/topics/ecigarettes.html. 15 Fiore, MC, et al. (2008). “Treating tobacco use and dependence: 2008 Update.” Clinical Practice Guideline. Rockville, MD: U.S. Department of Health and Human Services. 16 Centers for Disease Control and Prevention. “Coverage for Tobacco Use Cessation Treatments.” Available at: https://www.cdc.gov/tobacco/quit_smoking/cessation/pdfs/coverage.pdf. 17 Tsai, J. (2018). “Reasons for electronic cigarette use among middle and high school students – National Youth Tobacco Survey, United States, 2016.” Morbidity and Mortality Weekly Report 67(6): 196-200. 18 CDPHE. “2016 Behavioral Risk Factor Surveillance System Results.” Available at: https://www.cohealthdata.dphe.state.co.us/. 19 Pierce, John P, et al. (2018). “Association between receptivity to tobacco advertising and progression to tobacco use in youth and young adults in the PATH study.” JAMA Pediatrics 172(5): 444-451. Jalyn Ingalls joined the Colorado Health Institute in January 2018 as a Research Analyst. She was promoted to Policy Analyst in December 2018.